How do toads develop from fertilized eggs? Do toads need saving? These questions and more are answered in this excellent photo essay that records three years in the life of a female toad. The story is told in easy language accompanied by detailed, intriguing photos that will keep any animal lover engaged. This book will also draw in children (or adults) who may be less immediately interested in the subject, due to its clarity and effective design. Each full-bleed two-page spread includes a large photo taking up three-quarters of the spread and a blue rectangle (placed on the left or the right to vary the layout) with text that describes an important day in the toad’s development. Text is generally minimal, but it provides enough information for readers to follow the milestones in the toad’s life and to fully appreciate the picture sequence. This book can serve as a model for its type, with its clean layout, appropriate font, sharp photos, and accessible language. 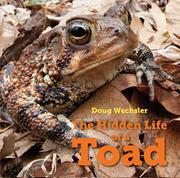 Ample backmatter that includes information on toad preservation and how the photographer did his work extends the wonder.